Precast concrete sills (also known as cills) are used below windows, ledges and transitions, and can even be used as architectural accents. We have a range of non-stooled sills available from stock and can also manufacture bespoke sills to your exact specification. What is a precast concrete window sill? An important structural and aesthetic element of any building, a precast concrete window sill keeps rainwater away from the window frame and offers support to the window itself. Sloped to direct water away from the window, a drip channel on the underside prevents water running down and staining the exterior wall of a building. 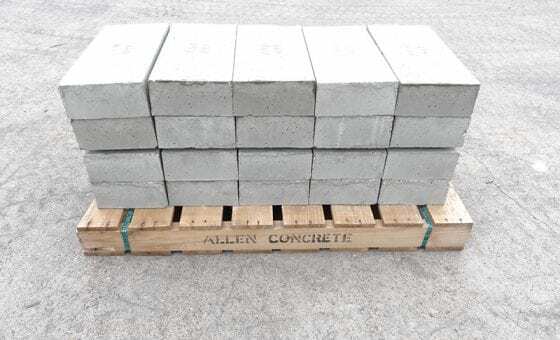 Used on commercial developments as well as residential housing projects, our concrete sills are precast in a range of standard sizes allowing for easy installation while on site. Bespoke sills can also be precast for one off dwellings or renovation projects. These are available in either 200mm or 250mm wide and in an extensive selection of lengths. We also manufacture window sills stooled in a heavy-duty section, 200 wide x 140 – 100mm high as left-hand or right-hand stooled sections or non-stooled centre sections. What are stooled window sills? What the exterior of the building is constructed from will determine whether you require stooled or non-stooled window sills. Stooled window sills are used when the property has an exposed brickwork finish. Stooling allows the brickwork to sit flush on what would otherwise be a sloped sill. For most other finishes, a sill without stooling will be used. This will generally extended beyond the window opening. We have a range of non-stooled sills available from stock in natural grey. They can also be cast in white or buff colour wet cast concrete. Depending on your requirements we can provide a fair face (smooth) or acid etch (lightly textured) finish if required. We can of course manufacture bespoke window sills to your exact size. For all our sizes and product drawings, please view our building technical specifications or call us on 020 8687 2222.